Impact absorbers are crucial as passive elements that boost occupant safety in vehicles in the event of an accident. Since, in situations of this kind, tremendous kinetic energy has to be absorbed, the crumple zones provided by the chassis and bodywork will often not provide sufficient protection. Even in minor collisions, occupants are thrown around the car despite their safety belts and the airbags. The consequence can often be severe head injuries and grazes. The aim here is to make full use of all opportunities for increasing the safety of the driver and passengers. Impact absorbers are an asset here and provide added protection. Impact absorbers are to be found at many locations in vehicle interiors. They tend to be used most liberally wherever knocks and scrapes occur from impacts during accidents. For example, an impact absorber mounted at the rear of the roof liner can absorb the impact of a head hitting it by becoming deliberately deformed and thus avoiding far more severe injuries. The honeycomb and ribbed structures enable the impact absorbers to absorb kinetic energy and, as a result, decelerate extremely fast motion. The secret is in a well-balnced mix of the right materials in conjunction with suitable geometry. Impact absorbers count as passive safety components and therefore have to comply – in America – with the FMVSS, Federal Motor Vehicle Safety Standard. Thanks to our know-how and experience in injection moulding, we are able to offer our customers perfect solutions for every application in the vehicle interior. 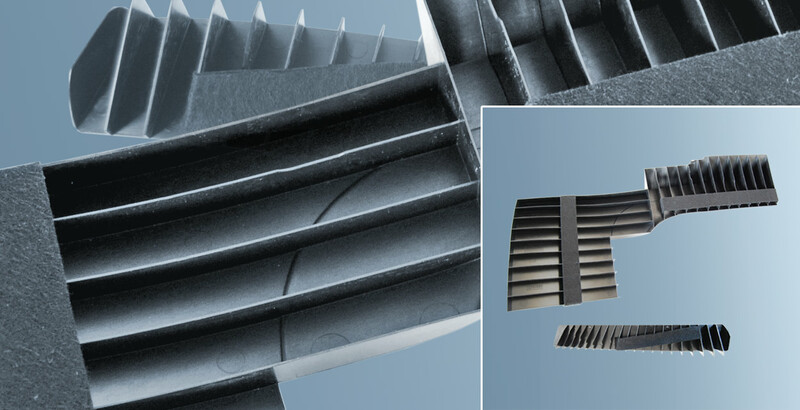 To guarantee optimum results, our engineers design impact absorbers that achieve top results in energy absorption through defined deformation of individual fins, ribs or complete subsections. In production, this means we are able to achieve wall thicknesses of only 0.6 mm by carefully matching the injection moulding process to our highly complex moulds. This reduces the weight of the impact absorber and still guarantees full functionality. We will be pleased to advise you and create the ideal solution from your requirements. © 2019, Dr. Haubitz GmbH & Co. KG, Dr. Haubitz GmbH & Co. KG , Solingen. All rights reserved. E&OE. Dr. Haubitz supports the "Aktion Mensch"